For Tungurahua volcano in Ecuador, one of the most active volcanoes in South America, 2009 was a relatively quiet year of rumbles and roars, occasional crater incandescence, and periodic plumes and ashfall. The new year of 2010, however, has brought clear signs of an awakening of Mama Tungurahua. 30 December 2009 – long-period earthquake followed by fumarolic activity with a steam plume reaching 300 metres above the crater. 1 January 2010 – beginning of emissions with low ash content, accompanied by rumbles that have gradually increased their intensity. 4 January 2010 – increased ash emissions with eruption columns reaching as high as 2 km above the crater, ashfall reported to the west. It is evident that the volcano has begun a new cycle of activity; the changes experienced have been shown in a rapid way, different to that seen on previous occasions when to generate the seismic activity that has been shown in the last 24 hours the volcano had to ‘work’ for weeks and months. In any case the activity occurring both at the surface and internally is considered to be at moderate levels but with clear signs that it is increasing. Volcanologists have warned that substantial ash emissions, on a scale similar to those of summer 2006, cannot be ruled out. Heavy ashfall would have a damaging impact on agriculture, and local farmers and civic leaders are worried. Local communities are making preparations to deal with increased activity from Tungurahua, with efforts being made to stock up on face-masks and medical supplies and to prepare emergency shelters in the provinces of Tungurahua and Chimborazo. The South American republic of Ecuador, spanning the northern Andes, is not exactly short of volcanoes: more than 50 Ecuadorian volcanoes are known, while the Global Volcanism Program lists 20 volcanoes with Holocene activity, including such great names as Cayambe, Reventador, Cotopaxi, Chimborazo and Tungurahua. Well, there are going to be some additions to the list with the news that no fewer than five previously unknown volcanoes have just been discovered in north-central Ecuador by volcanologists Patricia Mothes and Minard Hall. The newly identified ‘Cosanga Volcanoes’ are located in the Cordillera Real between Baez and Cosanga, about 75 km south-east of the Ecuadorian capital, Quito, and have been named Lavas de Bermejo, El Dorado, Domos de Huevo de Chivo, Centro Pumayacu and Centro Cosanga. Of these five Mothes and Hall report that at least one, Pumayacu, is potentially active – more work is needed before the potential activity level of the other four can be determined. The Cosanga volcanoes are relatively low features, between 2,800 and 3,700 metres, and are also relatively young, having formed between 2,000 and 20,000 years before the present. Around Pumayacu pottery fragments of the Cosanga culture have been excavated, which Hall suggests indicates that inhabitants of the area around 2,000 years ago may have had to leave because of volcanic eruptions at that time. The identification of these unknown volcanoes was sparked by the discovery of obsidian in the Cosanga region. Further studies are planned, and Mothes and Hall do not rule out discovering yet more hidden Ecuadorian volcanoes. Posted by admin in activity reports, Colombia, Machín. Machín volcano, Colombia, 10 November 2008 (image copyright INGEOMINAS). A seismic swarm on Saturday has provoked the Colombian state geological service INGEOMINAS to raise the alert level for Machín volcano in western central Colombia to Yellow (III), ‘ changes in the behaviour of the volcanic activity’. According to a report in El Espectador, ’54 minor [earth] movements took place over the weekend at El Machín volcano. The largest of these was at 1.3 on the Richter scale. The seismic swarm took place from 5:00 p.m. on Saturday, and although small, is the largest to have occurred in 2009, after strong activity in 2008′. 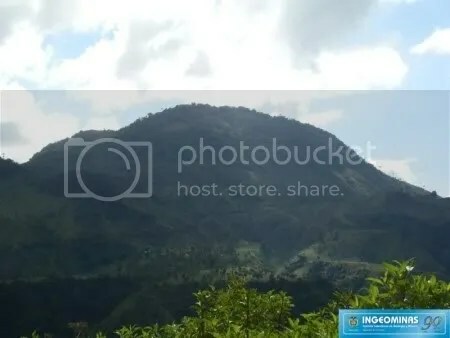 No bulletin on developments at Machín has yet been published on the Manizales Volcanological Observatory web site. Any reactivation of Machín would pose a substantial threat to a populous area of Colombia, including the large city of Ibagué (approximate population 500,000). UPDATE, 9 December 2009. A commenter at Erik Klemetti’s Eruptions blog observes that INGEOMINAS has had Machín at Yellow Alert for ages, and thinking back over my visits to the Observatorio Vulcanológico y Sismológico de Manizales site (where Machín bulletins are rather thin on the ground) it does seem that the yellow square has been a permanent fixture. I suspect the local press picked up on this activity because it’s the first for a while, and because the national government has prioritized a potential eruption of Machín as one of the principal natural disasters Colombia may have to deal with. In any case, the latest earthquake swarm is significant, and emphasizes the point that Machín needs careful monitoring. 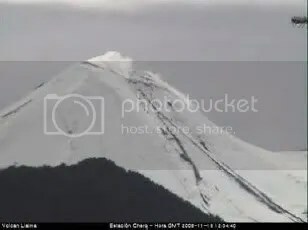 Posted by admin in activity reports, Chaitén, Chile, eruptions. In a remarkable development, SERNAGEOMIN has just released not one but two Chaitén bulletins to the public. Now available on the OVDAS ‘informes’ page are Chaitén bulletins 109 (PDF here, covering 16-30 October) and 110 (PDF here, covering 31 October to 13 November). Translations as follows. During this period the volcano has remained obscured and only occasionally on 25 and 30 October has it been possible to observe the dome complex and its column of gas and ash. In general, the base of the column has appeared much wider, although the altitude has not exceeded 1.5 km above the domes (Fig. 1). Fig. 1. 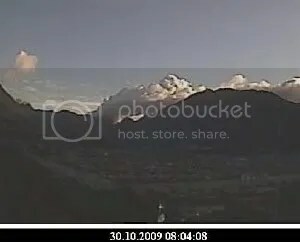 View from the DGAC camera in Chaitén on 30 October.